this is not just ‘another’ Childbirth Class! A FULL day of birth class?? This is a fun, informative and activity-filled day! Taught in our spacious, beautiful classroom near Fillmore and California Streets in the Fillmore district of San Francisco. Out of respect for you and your time, the class stays focused on the most important information that is relevant and appropriate and moves steadily through all the topics. You will walk out of class with the most up-to-date, evidence-based information available on birth. We will sort out opinions and myths from facts. We have great respect and passion for birth. Our goal is to be embracing and validating to everyone’s unique priorities and situation. We strive to present all options in a positive affirming way. Your level of participation in class is entirely up to you. You will only be called upon if you want to volunteer. There is time for connecting with your partner and occasionally with other couples. The day flows with ease. Educators Felicia Roche and Connie Sultana offer an engaging, evidence-based class to prepare you for this extraordinary time in your life. At BABE, we’re on a mission to increase confidence about childbirth and life with a newborn! Learn practical tips to optimize your birth, postpartum and newborn parenting experience. You and your partner will explore a variety of options through storytelling, demonstrations, video, and hands-on activities. Come ready for a full day of active learning with BABE, the Bay Area’s premiere childbirth education resource! 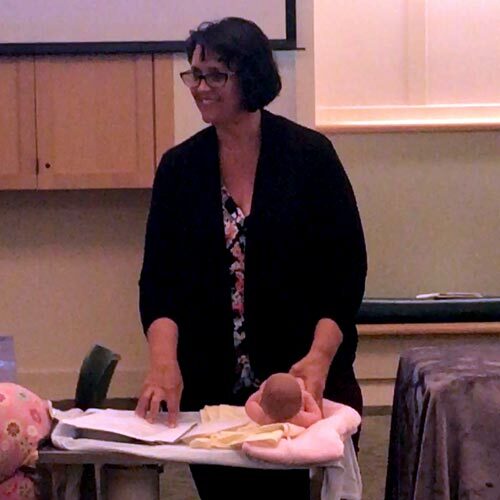 Educators Felicia Roche and Connie Sultana offer an engaging, evidence-based class filled with practical tips to optimize your birth, postpartum and newborn parenting experience. Through storytelling, demonstrations, video, and hands-on activities, you and your partner will explore a variety of options to prepare you for this extraordinary time in your life. Come ready for a full day of active learning! Birth is not just another day and this is not just ‘another’ childbirth class! As a Doula for over 20 years, Felicia incorporates her experiences of assisting with thousands of births to provide expectant parents with options for natural coping techniques as well as options for optimizing medications and epidurals. She is a seasoned Lamaze Childbirth Educator who shares coping techniques, breathing strategies, positions for labor & birth, and partner support as part of your preparation for birth. Most expectant parents find their focus to be preparing for birth and a newborn. This session will help you prepare for some of the realities of your postpartum recovery and how to get ready to have the best postpartum and breastfeeding experience. We cover newborn hospital procedures, breastfeeding tips, facts, strategies and positioning. newborn care: diapering, swaddling, bonding, bathing. finishing with infant massage and newborn soothing. Build your confidence to handle an emergency at home! Both CPR and choking response are covered in the safety portion of your one day class. 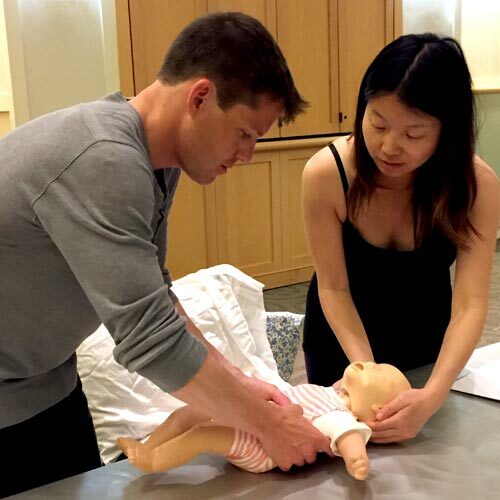 Each “couple” will have hands-on practice with an infant CPR mannequin provided by BABE. You will be trained by an experienced and certified CPR instructor with the sole focus of infant CPR. Please fill out the form below to contact BABE. We look forward to hearing from you!